As you brace for a cold winter in the next couple of months, think back to a warm sunny Saturday afternoon beachside with sand, surf, friends and your favorite tunes playing. 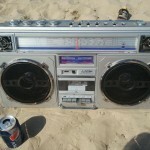 Casper Yardely shared some shots of one of his stereos (he has several) on the beach. He says, “The Aiko ATPR-9000 is the regular one that goes, thought one week I brought the Marantz CRS-4000… nervously. A JVC RC-656 makes its way up from time to time, and a Realistic SCR-8 once in a while goes along for the ride. The Aiko is the “beach goer”, and Its ridiculous how many people comment on it as we are walking there and even while we are there. Others have their cheesy iPod docking stations which sound horrible with exaggerated treble and crappy bass, where as the units I bring have the “throw” of mid-range and realistic treble and bass. All the same, I have yet to once see any body else… not one… have a traditional beach boom box up there…” By the way, Casper has a shop in the Chicago area and he can help restore your favorite radio if you need it. Look him up and give him a shout! This entry was posted in Boombox Golden Years by pocketcalculatorshow. Bookmark the permalink.